My disassembled furniture does not look this organized right now. I used to consider myself a competent person capable of following pictograph instructions and lining up planks of wood with pre-drilled holes. And then I actually tried to assemble a piece of Ikea furniture, which began with me sitting in a pile of deconstructed parts because I was too overwhelmed to try and decipher the instructions quite yet and which ended with the entire structure collapsing as soon as it was moved. I spent approximately five hours putting together a piece of furniture that quickly became expensive trash. 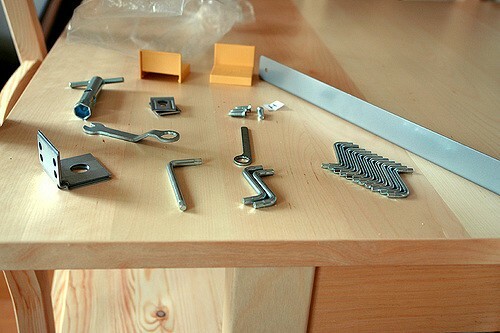 And yet, despite that neon sign proclaiming, “You’re Not Good At This,” I thought I could assemble a dresser. It would be different, I thought, because I had learned from my past mistakes and because the dresser wasn’t from Ikea. I see now it was cruel of me to blame Ikea, and I miss the round alphabetized stickers. Despite my dubiously best efforts, I’ve once again found myself surrounded by sloppily assembled pieces and a sea of Styrofoam, cardboard, and poorly labeled hardware. And although I haven’t made it past Step Four, and although I think I may have already wrecked one of the pieces of this deconstructed dresser, the two hours I’ve spent playing charades with a mute sheet of paper have provided ample time for self-reflection. In the process thereof, I’ve learned at least five things about general standards of behavior, all of which are illustrated by how badly I assemble furniture. Treat the kindness of others deferentially. I did not buy this dresser. This dresser was a gift from my mother. She spent two weeks listening to me sniffle about worsening leaks in my ceiling, sparse space for my over abundance of clothes, and literally everything else that happened to inconvenience me during that period. In an act of grace, mercy, and probably exhaustion, she bought me a dresser. As I was going about assembling this dresser with my usual technique (i.e. force the pieces together until they vaguely look like they fit) I was struck with how poorly I was treating my gift. This was an expensive piece of furniture bought for me for longevity. Ripping it apart would not only leave me without storage space I desperately need, but it would disrespect the gesture and the money that my mother extended. I partially disassembled my work to salvage it from further damage and stepped back to write this article so I wouldn’t have to make that phone call to my mother. Speaking of destroying pieces by forcing them to fit: if something isn’t working out, bearing down risks damage beyond repair. This was a lesson I should have learned from my first botched assembly job, but unfortunately it didn’t stick until I drove in a crooked screw with such obstinance that the wood cracked. I’m reminded of a summer in middle school, when my friend’s dad tried (in vain) to teach me to wakeboard. My biggest obstacle was the fact that whenever I wiped out, I refused to release the line even as the boat dragged me through the water. More than once, the board was ripped from my feet before I finally conceded and released the line. While I consider tenacity one of my better traits, tenacity to the point of irrationality is stubbornness, and stubbornness ends with a collapsed piece of Ikea furniture. I damaged a plank in my new dresser because I was insistent that I would not be bested by a piece of furniture. I tried to compete with an inanimate object and I lost, because that’s ridiculous behavior. This holds true for relationships too, platonic or otherwise: if there is a fundamental flaw, bearing down on that flaw only causes further fracture. It’s not worth the time and effort if your attempts at stability end with a large, clunky, unusable, faux wood paperweight. Assembling furniture is not a Machiavellian pursuit. Asking for help is okay. As a matter of fact, asking for help is okay in almost every situation and Machiavelli was (arguably) a satirist. That being said, maybe don’t immediately ask for help. Being initially overwhelmed is a poor excuse if you haven’t attempted to piece apart a problem. Per Aesop, try and pull your own cart out of the ditch before you bother Heracles. But, if you find yourself having to straddle your partially constructed piece of furniture in order to prevent it from falling apart when it should be standing on its own, then maybe phone a friend. It helps to consider the pieces as a whole. My biggest struggle with the insubstantial pictographs is that they tell me in vague (wordless) terms what to do with pieces without explaining the role of those pieces in the finished product. I’ve already cracked a piece. It’s not a bad crack, but I have no idea what that piece’s role is to the dresser. I have no idea if I should be worried about weakening its stability. I’m not sure how to proceed with Step Four because I don’t know how Step Four’s pieces should look on the completed dresser. This may be a personal failing; being unable to visualize the pieces coming together early on in the process could just reflect how I logic. More than once in my forays in furniture assembly I’ve had Oh! moments where I realized the purpose of a piece, and thus knew instantly how, where, and why I should fit it. Unfortunately, those Oh! moments don’t come around until the piece of furniture actually begins to resemble furniture, at which point I’ve already botched earlier steps in the process. The same holds true in the workplace: if I don’t understand why I’m completing a task, or how my task will fit into a larger goal, my product suffers from my uncertainty. In these cases, refer to #4 and ask. Or just flip ahead in the instruction manual. That never works for me, but maybe it’ll work for someone better than me at simple concepts such as fitting dowels into holes. (Bonus!) Consider how your actions affect others. Right now, my cat is in deep distress because instead of sleeping, I chose to cover my bed in half assembled furniture and write this article. I did this even though I’m fully aware that my cat is of the opinion that she must be tucked into bed by 10:30 pm and that she must be tucked into my bed, in a spot cleared of any extraneous bedding or objects. The fact that she has her own miniature recliner is inconsequential, and it is rude of me to disrupt her schedule this thoroughly. I’m still not sure how I’m going to get this dresser built. I certainly won’t be doing it all tonight, as originally planned. But, that’s probably for the best. Treating this as I did previous projects would reflect stunted growth and a misuse of failure. Also, most of my clothes are in trash bags, and I really need this dresser to work out.